During the 2018 SGA election season, students ran on platforms seeking to bring awareness to student demographics and on-campus issues. Many candidates have advocated for increasing retention and issues such as parking, menstruation supplies and increasing student involvement on campus. What can student candidates do if elected? Campus officials weighed in with their input. Several candidates have promised to improve parking on campus. The most specific change proposed came from presidential and vice-presidential candidates Ashley StClair and Devon Johnson. They have promised, if they are elected, that they will end the ticketing of vehicles on campus in the evenings. According to Jim Spice, director of Parking and Transportation Services, improving parking is a platform that candidates have been running on for years. Currently, students can pay for an evening parking pass. Doing away with evening ticketing would mean doing away with evening parking permits as well. “If we didn’t ticket in the evenings, the evening people wouldn’t buy a permit. We need everybody who parks on campus to pay because our parking budget is completely reliant 100 percent on permit sales,” Spice said. Parking tickets are not used to generate money for parking services, Spice said. Instead, enforcement is designed to encourage everyone to follow the rules. “Any revenue that we make in parking tickets above the cost of parking enforcement goes to student scholarships at the Family Development Center. We literally make no money off of enforcing. The only reason we enforce is to keep a fair system,” Spice explained. The parking budget includes parking lot lighting, maintenance, snow removal and parking lot security. Spice also explains that ticketing in the evening helps to make parking fair to all students. “Why should the day people have to buy a permit and the night people not have to?” Spice said. Candidates have also discussed making the parking rules more clear for students. Spice welcomes any opportunity to help students better understand the parking system. “Communication is super important. If there’s confusion out there about what lot is what, I am definitely willing to work with people about what their ideas are to help students,” said Spice. Lisa Hinton, candidate for senator of Letters, Arts and Sciences, and Justin Jones, candidate for senator-at-large, are hoping to use their positions in SGA to better serve veteran and military-affiliated students on campus. Hinton stated that she has not seen much support for veteran and military students on campus since coming to UCCS. Tim Little, president of the Student Veteran Organization, disagrees with that assessment. “I feel that we have plenty of support here. It’s always good to have more, but it’s hard not to give support when 2000 of the students are former military or current military,” said Little, a senior geography and environmental studies major. Heather Nicholson, assistant director of the Office of Veteran and Military Student Affairs, works to support military-affiliated students on campus through tutoring and career counseling. “Our primary focus is on offering educational benefits, but we also offer our outreach section which is responsible for doing events here on campus. The SVO also does events on campus and off campus. We are at every orientation,” she said. Along with offering events for students, the Office of Veteran and Military Student Affairs has a lounge for students to relax and study. “I would encourage people to come to our office, because it is not just an office, it’s a student lounge. They can watch TV. They can get coffee and cookies. They can study; we have a computer lab here,” Nicholson said. They are welcome to suggestions on how to better support military affiliated students on campus, said Nicholson. Kaitlyn Sethi, candidate for the senator of multicultural affairs, plans on bringing free menstruation supplies to some of the buildings on campus. According to Stephanie Hanenberg, executive director of Health and Wellness, the Wellness Center cannot afford to supply buildings with menstrual supplies. “Unfortunately, there is no funding currently to provide free tampons on campus. We would have to cut programs and services to provide that service,” Hanenberg said in an email. Sethi ran on this platform for senator of multicultural affairs last year. During that time, Hanenberg looked at other universities to see if they had similar programs. “I did a survey of other campuses across Colorado, and at that time, no campuses were offering free tampons. Unless we were to get increased funding, I don’t think this is something that is a viable option for the campus,” said Hanenberg. Hanenberg suggests that alternative options would need to be considered. Lance Peltier, candidate for senator of business, would like to use his position to improve Mountain Lion Stadium. He would like fresh drinking water and locker rooms to be added to the stadium. According to Nathan Gibson, the executive director of Athletics, there are locker rooms and drinking water near Mountain Lion Stadium. “We do have locker rooms; they are just adjacent to the facility. We do have drinking water. I’m just curious where the thoughts are coming from,” Gibson said. The area near Mountain Lion Stadium has grown in the last few years with the addition of the Ent Center, baseball stadium, field house and the future Hybl building. Gibson explained that the university is looking at what the future of the area will look like. All renovation projects on campus must go through a thorough planning stage before they can begin where the university looks at the cost of the project and the potential benefits it will have for students. The athletic department must coordinate its plans with the facilities master plan, and planning can take years. The athletic department has asked for SGA’s input in previous projects, and Gibson says that they would be interested in working with SGA again in the future. “I know that the campus will want student input and I think that if I were speaking with members of SGA, what I would say is get involved, be involved with the master planning, the facilities planning for campus, because that’s a great way for your voice to be heard,” said Gibson. 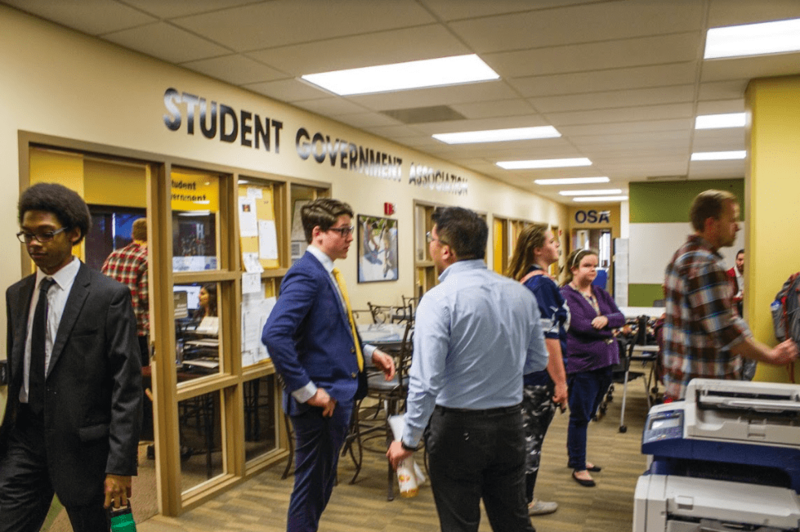 All president and vice president candidates, which include Sierra Brown and Laveen Khoshnaw, Ashley StClair and Devon Johnson, and Augusto Tomszay and Philip Oke-Thomas, have promised to increase student retention on campus. Proposals have included increasing student knowledge of the effects of drugs and alcohol on mental health and promoting more on-campus activities during the weekends. Ray Fisco, prevention and outreach coordinator with the Office of the Dean of Students, and Benek Altayli, director of Mental Health Services, both say that it is true that the abuse of drugs and alcohol can cause students to drop out. Fisco helps run Smart Move UCCS, a program that teaches students the negative effects of alcohol. Students who are found to be using are required to attend a class called Choices, which helps them to make better choices in the future. Altayli explains that some students who engage in substance abuse do so to self-medicate themselves for mental health issues. In those cases, education about the negative effects of drugs and alcohol might not make as much of a difference. “For that subgroup, it really doesn’t matter how much information that you would give them, because they don’t engage in the behavior for social reasons. If there is anything else that they are trying to remedy with substance abuse, we have found that information is only marginally effective,” she said. Instead, the university works to find these students and help them get into therapy to treat them for their underlying issues. They want to reach them as early as they can to help them stay in school. Smart Move UCCS would be interested in doing more education events with SGA. According to Altayli, students who make connections with people and organizations that they enjoy are more likely to weather the stresses of school. Smart Move currently cannot hold events on the weekends due to limited funding and staff, but SGA assistance can help, explained Fisco. “ I would love to, but for the foreseeable future, I don’t see our office having events during the weekends. If we were able to get more help, if we were able to get more staff, then absolutely, we can try to do things over the weekends,” Fisco said. The election closed March 16. Results are expected to be published following the infraction tribunal to evaluate the vote counts and any potential election infractions.